Recently one of our users asked us for an easy way to add nofollow to their links in WordPress posts. Unfortunately while WordPress allows you to open a link in a new window by default, it does not allow you to easily add rel=”nofollow”. Up until now you either had the option to nofollow all external links automatically or manually add the nofollow tag to each link by editing HTML. In this article, we will show you how to add a nofollow checkbox to your insert link section in WordPress. This will allow you to easily nofollow links at the time of writing your post. Why Add rel=Nofollow to External Links? In terms of SEO, each time you link to any page whether its on your own site or an external site, you are transferring SEO points to that page. These SEO points are most commonly known as the link juice. This is why most SEO experts recommend you to link to your own older posts (make internal linking a habit). Now if you write a post that has both internal links to your site and external links to other sites, then you probably want to get the maximum link juice to your internal posts. You can do this by adding a nofollow attribute to your external links. 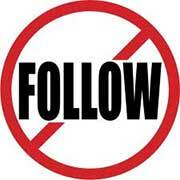 Nofollow attribute instruct search engines to not transfer any link juice from your site to the external site. This is how a rel=nofollow attribute is added to a link. Now if you use Visual editor and add your links by clicking on the link button, then you would need to switch to Text editor to add this attribute to the external links. This could be very annoying if you have several external links in a post. Let’s make that easy. First thing you need to do is install and activate the Title and Nofollow For Links plugin. It works out of the box and there are no settings for you to configure. Simply go to post edit screen, click on create link button, and you will see a nofollow checkbox just below the Open link in a new window/tab checkbox. 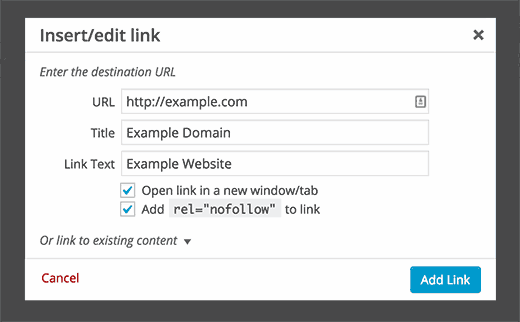 Now you can add rel=nofollow to any link when writing a post. Most bloggers do check the Open link in a new window/tab checkbox when adding an external link, so this checkbox is conveniently placed and makes it super easy for you to add rel=nofollow to external links. We hope that this article helped you add rel nofollow to external links in your WordPress posts. If you have any questions or feedback, then please leave a comment below. Also don’t forget to check out our YouTube channel for our WordPress video tutorials. How can I add a nofollow to Buttons and images when using Visual Composer? As this article has been written in 2015, does it still stand? I mean, can I follow this tip even now? Am I able to get the nofollow option if I only have a personal site? Seems like you are using WordPress.com. Please see our guide on the difference between self hosted WordPress.org vs free WordPress.com blog. Question: if I add a rel=”nofollow to blog X, can blog X still see the incoming traffic from that link? Also, does it affect the Google Analytics for blog X at all? My point: I want blog X to see that I’m driving traffic to them. Will that traffic still be seen in the stats of blog X if I use nofollow? Yes, the linked website owner will still see the incoming traffic from your website. It will also appear in their Google Analytics reports. You will need to use the text editor in order to see the insert link popup with the nofollow checkbox. As of ~2007, nofollowed links still leak their PageRank; the linked page doesn’t recieve the juice, it simply dissolves. There are some good reasons to nofollow some external links (such as affiliate links), but SEO and preserving PageRank aren’t one of them. Thanks so much, this was really helpful! I have just started my new website on wordpress and I have been wondering how to do this! Glad you found the article helpful. Don’t forget to follow us on Facebook for more WordPress tips and tutorials. then , how to add no-follow links ? Thank you for that. I wonder what about affiliate links? Is it gonna affect how they can track the traffic / sales coming from my site if I add the no follow tag? Yes, they will be able track your traffic. If I am writing a sponsored post from scratch (i.e. not simply linking to it in a blog post), how do I make the permalink to it itself a no follow link? Do I edit the permalink at the top where it says edit, or is nofollow only important for when I am linking to it within a post? I came across this article while trying to find an explanation of this – I absolutely, with 100% certainty do NOT have this plug in installed. However, I do have the check box. It is my understanding this is not a wordpress feature. Could there be some other plug in or maybe my theme that has this written in the code? I am baffled. I am on Genesis using Divine child theme. So far as I see, there are no other relevant plug ins that I have other than Yoast that this would belong in. I am having this same exact issue. Did you ever figure out what was putting the checkbox there? I haven’t been able to find it in any of my plugin settings. Thank you for this info! I got the plug in you suggested, and it works great. I couldn’t figure out how to add it to images, but I’m trying to figure it out. Thanks again. Why do I need this plugin? Wouldn’t it be best not to have a link at all? Is there a way to have it correct past links as well or doe sit only make the links going forward no follow? No it does not change old links on your site. This plugin is now compatible with WP 4.0.1. I think it’s the simplest solution of all. Other plugins tend to nofollow all external links which is sometimes not exactly what you want. The rel nofllow checkbox is simpler, yet gives you more control over your link juice. While I think this feature should be part of WordPress core features, I am so very glad to find a simple, lightweight plugin that does the job so beautifully. Thank you! Since WordPress 3.9, this plugin don’t work. v1.0.1 is compatible with WordPress 3.9. @Fábio Santos thanks for the update. If a plugin is well coded they do not cause any problem to your page. There is also a plugin called simply “rel nofollow” on WordPress.org, which will simply automatically add rel=”nofollow” to every link on a page when you save it. It looks like the support is pretty sketchy, but I just did a mass quick edit, and did nothing but save every post in one of my WP sites, and added rel=”nofollow” to all of the links in nearly 300 posts in one operation. Does this plugin allow to exclude internal links from nofollow? With this plugin you can simple choose what link must be “no-follow”. Do you read my mind, guys? Just what I want at the right time! Wow, thank you. One more thing, how can I follow the comments that I have made on your blog?